You can find this little gem on JP Morgan’s Asset management website, including the “Guide to the Markets” PDF and audio commentary. Topics include Equities, Fixed Income, International markets, the U.S. economy, as well as alternative investments and investor behavior. 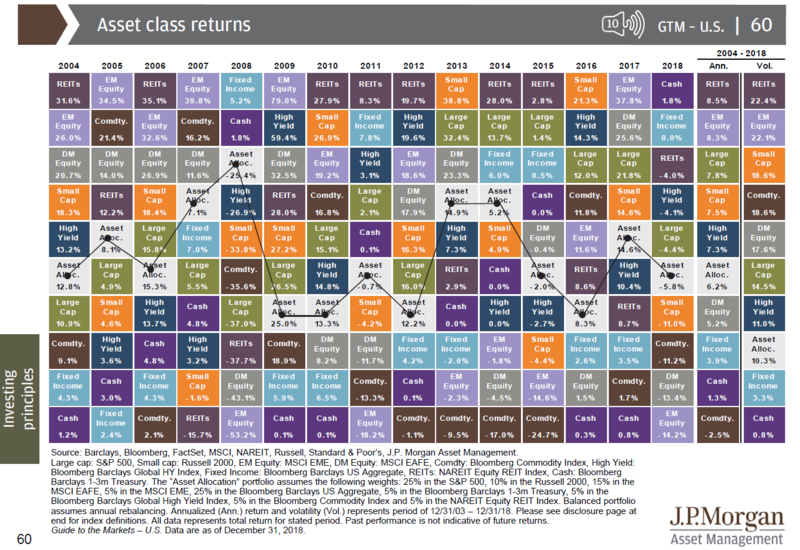 Since this edition covers all of 2018, we can even take a look at annualized asset class performance. Cash was king last year…though with a 1.8% return that’s not saying much. 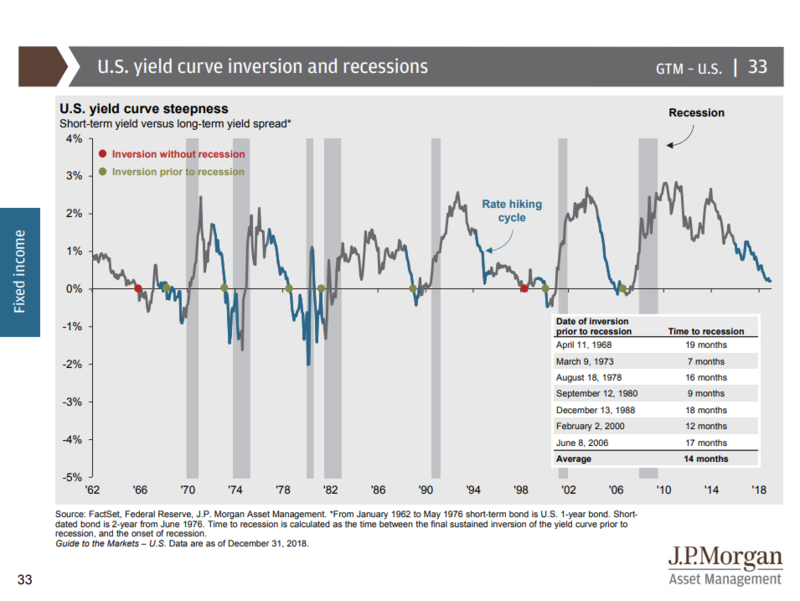 An inverted yield curve is a pretty good signal for a recession. As discussed before, where not quite there yet. I seems like an inevitable outcome of rate hiking cycles…maybe it will get postponed like the mid-90’s. 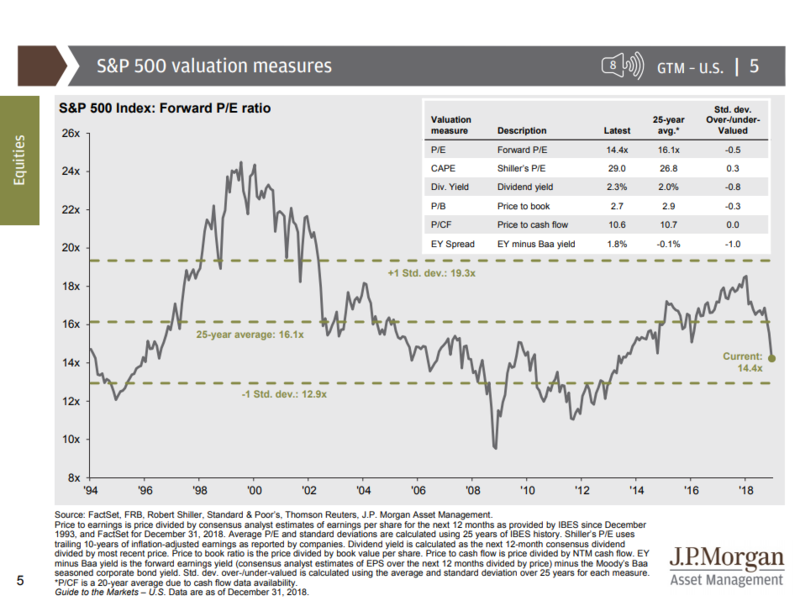 After the 2018 Q4 sell-off, some valuation measures for the S&P500 look pretty good verses a 25 year average. Forward P/E ratio is affected by our abnormally low interest rates, so I wouldn’t say the S&P is “cheap”. But it’s trending in the right direction if you’re looking to add more dividend plays to your portfolio. This entry was posted in Current Events, Historical Data, Investing, Market Trends, Uncategorized and tagged asset allocation, economy, fundamental analysis techniques, JP Morgan, market outlook, market trends, technical analysis techniques, US Stock market. Bookmark the permalink.